Unspoiled by progress, the Victorian “treasure island” of Block Island is located approximately 13 miles south of Rhode Island and is separated by the Block Island Sound. Whether you take a ferry or travel by air, this popular summer tourist destination features two historic lighthouses, excellent biking and hiking trails, and many acres of untouched natural areas for migratory birds. Every summer, Block Island holds their annual Block Island Race Week, a week-long sailboat race, in addition to their annual Fourth of July Parade and the Block Island Arts Festival. Another fabulous attraction is the U-853 U-boat wreck, located seven miles off the coast of Block Island – a great destination for recreational divers. Visit the area’s numerous galleries, antique shops, village stores, restaurants and inns. The Rhode Island lodging choices include: Providence Biltmore, Marriott, Hampton Inn, Hilton, Hyatt, Best Western, Quality Inn, Day’s Inn, Motel 6 and others. 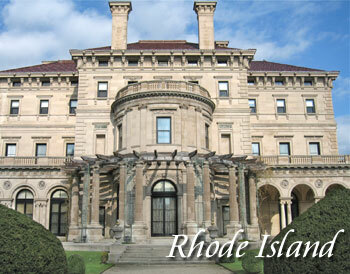 Contact us to add your Rhode Island hotel or lodging property. Warwick is the second largest city in Rhode Island and is home to Rhode Island’s largest airport, T. F. Green Airport. T. F. Green Airport serves the greater Providence area and is also used as an alternative to busy Logan International Airport in Boston, Massachusetts. Warwick, RI is the home of the 43rd Military Police Brigade of the Rhode Island Army National Guard. The city is of Warwick is part of the Providence metro market. The Community College of Rhode Island Knight Campus is located in Warwick. The oceanfront town of Newport attracts thousands of visitors to view the magnificent waterfront mansions. The famous Newport Jazz Festival still takes place in this beautiful oceanside city every summer.